Hi everyone, sorry for the lack of Summer Heat Series, I’ve been busy with photography and work but I am back onto writing! 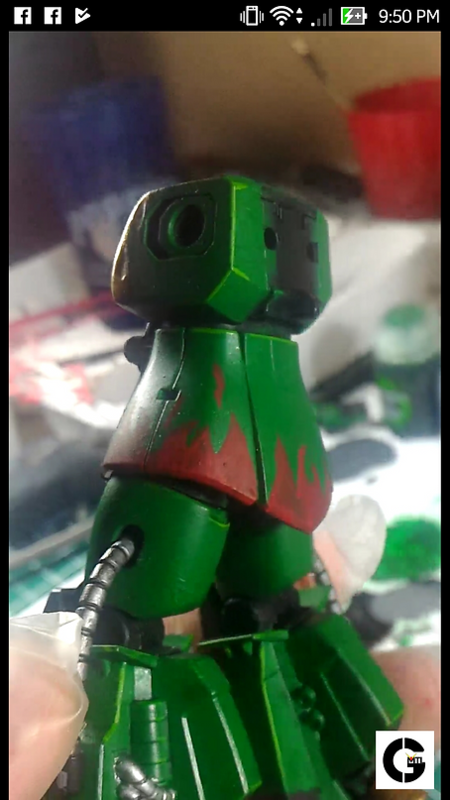 After the initial base coating and wash, I started the highlighting phase by grabbing a fine detailed brush and a lighter green. Using Moot Green, and a steady hand I slowly went along the edges of where highlights belong. You can see how the highlights bring life and texture into the model. Edge highlighting creates artificial lighting when lighting is limited. But why the black? Black highlighting creates an angle to where your eye will be tricked into thinking there is a light source. The next phase was to paint my mix tape…I mean the fire. I started with a hand painted design on the sides and back of the armored skirt. Yes this is a screen shot, originally from a video on my phone. And yes, I filmed it vertically. But back to the topic, the red I used for the very first layer was Mephiston Red, and using a detailed brush. Eventually I got both side skirts and the back. I kept the front free from fire to keep the model’s overall appeal interesting and eye catching. The next layer of paint I used was Wild Rider Red. Following the same base layer pattern, but slightly smaller. From the red paints, I made a transition to orange. Red Dragon Night was used for the orange paint. Why orange you ask? Well Orange is a great base for yellows, that’s it, no really that is it. The yellows followed, yup, 2 types of yellow paint. Yriel Yellow was the first layer of paint again following the original layout with a smaller version. 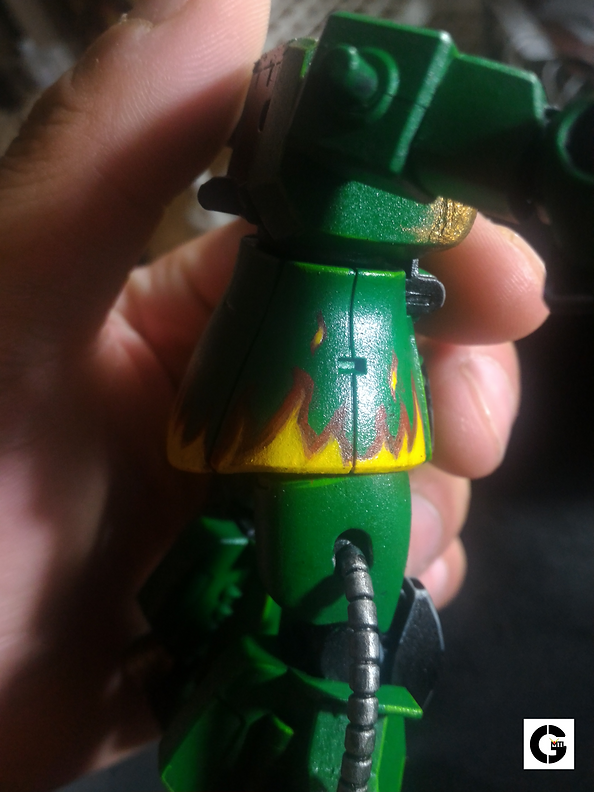 Last but not least, I painted 3 layers of Flash Gitz Yellow to create the fire design. You can see each of the layers I used in the picture, by creating several layers I got that depth the model needed. To finish this article, the shoulder piece is the last thing we shall discuss. 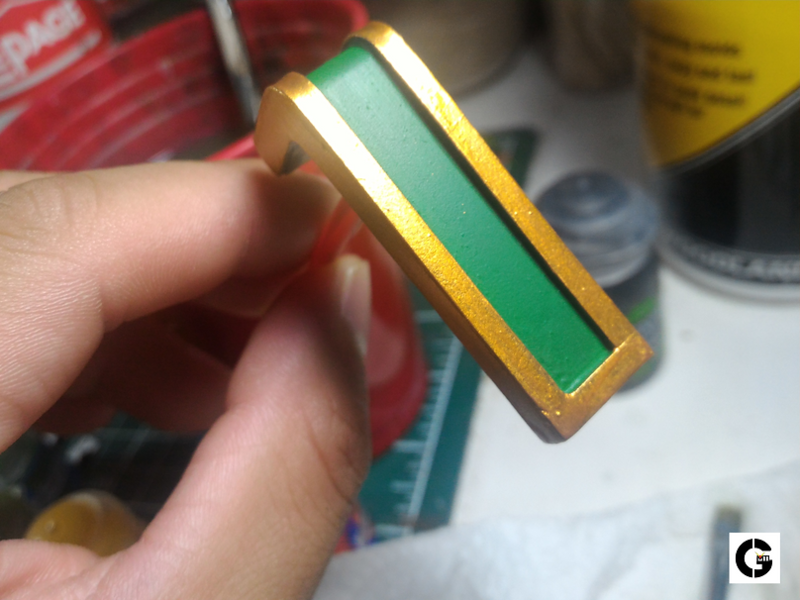 I went with a copper like gold and the inner piece with the same green I used to base the entire model. The gold I used was Gehennas Gold. It took about 6 layers of watered down gold, followed by a wash of Casandora Orange, then finished off with 2 layers of Gehennas Gold. On that note, I will finish this article off hear. My tip of the day (hehe), be patient with your paint. I was painting Warhammer Models before gunpla so that is where I got my skill and preference of painting. Practice, practice and practice some more. Eventually you will improve.